Few cars in racing history have created such an uproar at the Indianapolis Motor Speedway, created such interest, attention and controversy, and wrote so much history in only one single race. This is a report on a car that shook the entire Indy scene because of its existence, performance and subsequent rule making at Indianapolis. A car that, with hindsight, appears to be an utter success. But one that, also with hindsight, could have been an embarrassment if it wasn’t for a masterstroke. A car that put an entire team on the wrong foot and for which, combined with other events the following year, the team had to pay dearly one year later. A car that once again proved Roger Penske's cleverness in how to obtain and use the 'unfair advantage', one that secured him yet another Indy 500 victory. A car that proved that Roger Penske could turn every rule introduced at Indy to counteract him and other prominent CART team owners into his favour. But also a car that contributed to his biggest embarrassment ever. A car that showed sanctioning bodies how dangerous it can be to allow multiple kinds of engines in one single race, despite all good intentions. A legendary car in Indycar history, one that scored a 75% victory rate during the CART season that year, including the 500 miles at Indianapolis. The latter because it was transformed into a special version that only ran at Indianapolis, and it was this version that wrote motor racing history rarely seen before or after. It's quite a story, the history of the 1994 Mercedes-Benz 500I-engined Penske PC23. The heart of the legendary Penske PC23-500I. Without it the legend never would have taken place. Nothing happens without reason. 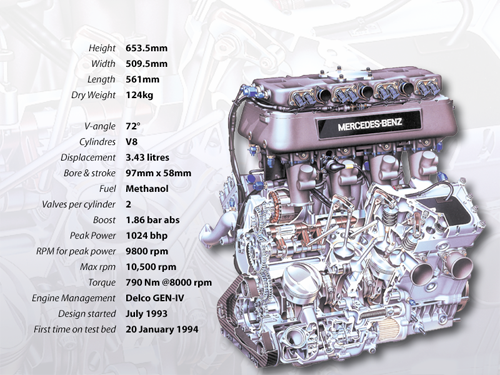 The Ilmor 265E or Mercedes Benz 500I engine was a result of several factors, all combining to justify its creation. Therefore I have given extensive attention to all of these factors to make you understand why all the men behind this project got involved in it. 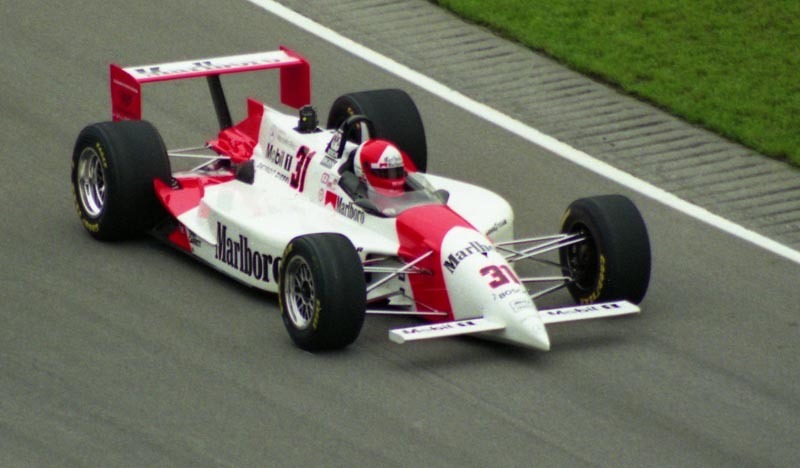 Although my focus will be on the Indianapolis version of the Penske PC23, I will also devote some attention to the PC23 cars' further career, since the following year events took place at Indianapolis that, with hindsight, were related to the Penske onslaught at Indianapolis in 1994. These events are so important that I include in this history in order to make a more balanced judgement of the entire Mercedes-Benz 500I project. It is therefore that apart from the introduction chapters this series is divided in two major parts: 1994 and beyond 1994. Over the years the Penske-built chassis have always been identified as PC, followed by a number. Eventually an alternative numbering and naming system became in use as well, with the PC prefix followed by the year the type of car debuted. So in literature one can find reference to the 1994 car as the PC94. However, I will restrict myself to the use of type designation PC23. I must thank a number of people for assisting and participating in this project. Two men however, need to be mentioned first since their share improved the level of this work tremendously. My most sincere thanks go to Team Penske engineer Nigel Beresford. He was among the few people who knew about the Ilmor 265E before April 13, 1994. Nigel has been most helpful in filling in details about this remarkable project. He also took up the job to edit the forwarded chapters on language. I am most grateful for his priceless input and the many pleasant communications we have exchanged since we got acquainted. I'm also much obliged to famed illustrator Tony Matthews, a master in cutaway drawings. His breathtaking drawing of the Ilmor 265E has appeared on the Internet by now but I want to express my thanks for being able to include it here with his approval and permission. Fortunately, some more of Tony's fabulous drawings could be presented here because of their presence in several press kits. On top of that, Tony supplied a number of pictures of the Penske PC23 and the majority of Ilmor 265E engine pictures presented here. I want to thank the Mercedes Benz Presse Archiv for providing additional pictures. Also my sincerest thanks to Mario Illien for providing the picture above on this page. Once again, I am grateful to the Indianapolis Motor Speedway photo department and its director Ron McQueeney for their permission to use pictures from their archives. Also thanks to John Darlington and Brad Edwards of First Turn Productions LLC for making their pictures available for this project. With respect to the pictures, the majority of the photos in the chapters dealing with Indianapolis 1994 were made by myself on location at Indianapolis or elsewhere. Pictures provided by others and copyright holders of these pictures are identified as such. Use of these pictures is granted by the copyright holders. Please do not reproduce these pictures without their approval! Also my special thanks to Karl Ludvigsen, the most prominent writer of motor racing books giving attention to the Ilmor 265E project. I am grateful for his support and his permission to consult and use the relevant information printed in his books. The final chapters of this project ('after 1994') were delayed but were eventually finished with the valued help of the following people. Bill Ashby Sr, John Darlington, George Hatcher, Anthony Fosh and Mark Windecker provided pictures from their personal collection. IMS Photos photographers Jef Richards and Jim Haines were on duty at the Speedway in 1995, several of their pictures were kindly located and provided by Ron McQueeney. Without their assistance the 'post-1994' chapters would have remained virtually devoid of pictures. My sincere thanks also go to Mike Devin, USAC's Technical Director during the years in which Indianapolis saw the purpose-designed pushrod V8s appear at the track. He kindly provided an insight into the way USAC dealt with this era, how it was able to happen to begin with and why it had to end. Because of his cooperation, 'the tail of the Mercedosaurus Benz' required another chapter to tell the story as complete as I possible can. Also my sincere thanks to 8W chief editor Mattijs Diepraam. Without his site providing me with the space, and his support and editing efforts, this project would have remained on my harddisk and back-up USB stick for ever. Like the Ilmor 265E itself, it takes the right conditions to take place at the right moment to make something happen. The only book I am aware of that has pictures of at 99% of all roadsters ever entered at the Speedway. I know about people dismissing this book because it is 'only' a softcover but I rate it as a cornerstone publication for everyone interested in the development of Indycar technology from the beginning until 1980. Given the short time March lived on after the release of this book, this is one of those books that you wished, in hindsight, was published a bit later. Very much a 'home' publication released with Porsche's help. Regrettably released a year too early, otherwise a good insight into the Porsche CART effort. Vol 2 & 3 of this three-volume book contain chapters about the two Porsche Indy and CART projects, both victimized by US single-seater racing politics. A standard work with brief race reports and other important information of each year at the Speedway. INDY: Racing before the 500. The untold story of the Brickyard. IMS gained fame because of the '500' which is documented thoroughly. This publication is devoted to the events at the track before the very first '500' was held. A significant publication for Speedway lovers, dealing thoroughly with the least known events in IMS history. An overview of the career of the PC23's designer, with some interesting revelations about the glory years of Team Penske to which he contributed. Bennett doesn't avoid a serious discussion about the lesser years after 1994 either, also mentioning his own errors. Beast The Top-Secret Ilmor-Penske Engine That Shocked the Racing World at the Indy 500. The source you need to read for inside info about the entire Ilmor 265E project. 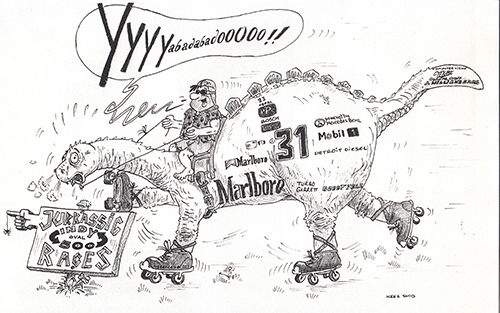 The official Marlboro Team Penske press kit of that year. It was printed before May ’94 and didn’t include a clue about the use of the Mercedes Benz 500I engine. The Mercedes press kit of that year, lots of PR but hardly, if any relevant info on the 500I engine. For example: the fact that the engine ran on methanol was one of nine lines of info! Released to announce the winner of the Award, Mario Illien, who designed the 500I engine. Doesn’t tell you much more about the engine, but then, did you expect that? Consulted for additional info about previous stock block projects. Even they were not permitted to tell anything of importance about the engine. I had the version released after the race had ended, thus including the Race Day reports. Lacking, however, are the pages with the Performance History results at the end of each practice day. Save one or two I had the loose pages available in the Media Center during practice at hand. I also used the booklet version published later on: 'Indianapolis 500 Daily Trackside reports'. Excellent publication about Mercedes-Benz racing history. Contains a chapter on the Indy efforts since 1994, concentrating on the 500I engine. Much info about the engine, including pictures and descriptions. Failure of Penske-Merc to qualify at Indy ’95 downplayed. A must for Mercedes fans, a rather expensive tome for Indycar fans only. A history on Ilmor Engineering and the engines it built for its partners. The alliance with Mercedes is dealt with too. Contains similar as well as additional info found in Quicksilver Century as well as the best available drawing of what the 500I engine actually looked like inside. The better (cheaper) choice for Indy fans since the other Ilmor-built CART and Indianapolis engines are covered as well. Very interesting fact: this book was available in 1996 and gives quite a number of 500I engine specifications while these same parameters aren't listed for both the 1994 Ilmor/D and the 1995 Mercedes-Benz IC108. Overview of 50 historical racing engines, each engine getting four pages in the book. The Mercedes-Benz 500I is included. Chapter not as detailed as in the other Ludvigsen books listed but it contains additional technical specifications of the engine. Chris Economaki with Dave Argabright. Books by Dave Argabright, Fishers, IN USA, 2006 ISBN 0-9719639-3-2 Biography about the most legendary of all journalists in post-war US motor racing, Chris Economaki. A page as appeared in an edition of On Track magazine, date unknown, but most likely released in the second half of August 1994. Dutch newspaper article covering the April 1995 tyre tests at Indianapolis. The May editions contain several articles about the practice and qualifying sessions at Indianapolis in May 1995, the November edition had info about the test with the ’95 type Penske held late November 1995. The pocket-size, spiral bound version released during May 1996. Program for the inaugural U.S. 500 race held at Michigan International Speedway, May 26, 1996. I had a pre-race version available.